Drain spa water every 2 - 3 months, depending on use. Wax spa shell with Highlight aerosol acrylic spa wax (do not use car wax on an acrylic spa !). Soak filter cartridge overnight in Filter Cleaner solution and rinse off thoroughly with water. If it does not come clean, replace the Filter. Squeeze out any surface oil removers such as Scumballs or Scumbugs and rinse them off with fresh water. Replace if damaged or used up. Refill spa with fresh water to recommended level. If using Ph Balance, Add appropriate amount to spa water (read directions on label). Run the spa on high speed (jets) for 15 minutes, then proceed with Step # 2. If you are not using Ph Balance, go directly to Step # 2. Add 2 bottle caps of concentrated Demineralizer or Metal Out to the water. Some brands require that you must add the entire bottle. Read the instructions on your bottle to be sure. Add 2 bottle caps of Spa Shock to the water. 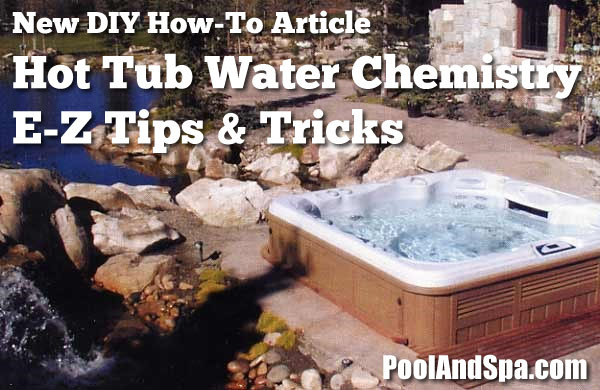 Do not use Non-Chlorine Spa Shock the first time when refilling tub with fresh water. Test and adjust the pH of the water to 7.6 - 8.2 by adding either pH Plus or pH Minus (Don’t do this if using Ph Balance). Test and adjust the Alkalinity of the water to between 100 - 120 by adding Alkalinity Plus (Don’t do this if using Ph Balance). Add 4 - 6 Bromine Tablets to the Bromine Floater and put the floater in the spa water. Run spa on low speed (heat) for at least 6 hours to heat up, properly mix all the chemicals and completely filter the water. If you would prefer to use an all natural product in your spa, then click here to learn more about Eco One All natural enzyme. Test water for Bromine, pH and Alkalinity. Add 4 - 6 new Bromine Tablets to the Floater if necessary. Try to maintain an average Bromine level of between 1.0 - 1.5. Adjust the Alkalinity to between 100 - 120 and the pH to 7.6 - 8.2 (Don’t manually adjust the pH or Alkalinity if using Ph Balance). Rinse off the cartridge filter with fresh water. Squeeze out Scumballs or Scumbugs and rinse them off with fresh water. Add 2 bottle caps of Spa Shock or Non-Chlorine Spa Shock. Spa water should filter on low speed for at least 3 hours per day. Bromine Floater should have Bromine Tablets in it and should remain in the spa at all times, except when you are using it. Scumballs or Scumbugs should remain in spa at all times, except when you are using it. They absorb surface oils and reduce “ring around the spa” at the water line. Ozonator (if equipped) should operate on low speed at least 3 hours for every 12 hours. If using an Ozonator, you should also use at least 2 - 3 Bromine Tablets in a Bromine Floater as well. Call us anytime for water chemistry advice or to order any hot tub chemicals or accessories. You can visit the “Info / Tips” section of our web site for more detailed water chemistry articles. 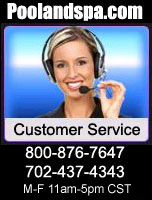 PoolAndSpa.com Customer Service Hotline is 1-800-876-7647 or 1-702-437-4343.